It’s one of the biggest challenges Sunday School teachers face – how can you make sure all your kids are entertained and learning when your classroom is filled with children of mixed ages? Hello, my name is Mary-Kate Warner and as a Sunday School teacher myself I’ve experienced this dilemma firsthand. So I know how tough it can be. Make your lessons too simple and you’ll lose the older kids, make them too challenging and you’ll lose the younger ones. Develop two lessons, one for younger kids and one for older, and that means you’ll have to leave one group alone while you teach the other, which is always a recipe for trouble. Often this dilemma can leave you feeling frustrated and maybe even like a failure as you begin to believe that you are not making the impact you should be making on all the kids. In fact, maybe you are feeling that way right now? 1: You are not alone – this is a genuine problem for any teacher of mixed age kids. 2: I’ve developed a solution for you – a solution that will allow you to skip all the frustrating trial and error I went through trying to find effective ways to reach kids of all ages! Over the years of teaching my mixed-age Sunday School class I began to notice that some games were much more effective in teaching kids of all ages than others. I began to regularly work these games into my class schedule and I never failed to be impressed by how they kept both the younger kids and the older kids both engaged and learning. Now please keep in mind I didn’t just find all these great games all at once (like in a minute you’re going to be able to do!). In between each effective game there were many, many ineffective games that ended up leaving me feeling frustrated and often wasted my kids’ time. 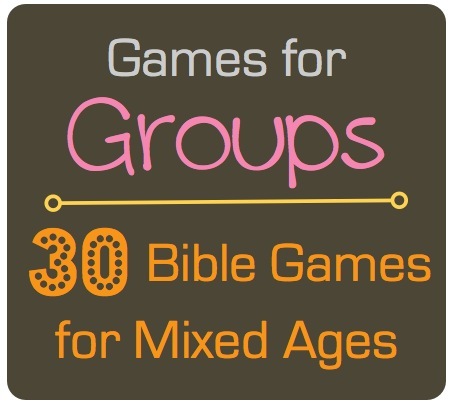 But eventually I was able to find a total of 30 great Bible games … and now I want to make those games available to you! – No Matter What Their Ages! Finding games for groups of students with varying ages has traditionally been very difficult … but not anymore! With “Games for Groups” you get games for kids of all heights, sizes and abilities. Some of the games require pairing an older child with a younger child … some offer “handicaps” for younger children … and the rest can be played by kids of all ages! These games are all designed to be fun and to teach kids about God and the Bible. Kids will learn Christian virtues and will get prepared for more intense Christian learning later in life – and they will be having tons of fun while they are at it. Some of these games require great action and others great reflection, but all the games combined with your enthusiastic teaching style will provide great entertainment for kids of all ages! So why continue to struggle to find games that will entertain all your kids? Why continue to stress about whether or not you are reaching all your kids? Why make yourself go through all the expensive and frustrating trial and error that I went through to come up with these games? When you could save yourself a lot of hard work and worry as well as valuable time and money by getting the “Games for Groups” Activity Kit today? Completely Skip Over One of the Most Frustrating Aspects of Teaching Mixed-Age Sunday School Classes! “Games for Groups” is filled with fun, easy to play games that will engage your students while teaching them about God and the Bible. There’s no easier way to reach kids of all ages – and since this activity kit is available as an instant download you will be able to begin using it immediately! The first group consists of games 1-15, which are designed to teach Christian virtues and often incorporate scriptures and/or the lessons of Christ. The second group of games (16-30) is very unique and encourages students to begin to learn the Bible, even if they’re not old enough yet to study it. In fact, these games are so unique that there may be no other games like them available anywhere! For example, they teach things like the 8 Beatitudes of Christ and His great “I AM” statements. Here’s another quick example of the uniqueness of these games, game #19 teaches the names of the ten major heroes in the Old Testament stories. Learning these names is an important part of pre-studying the Bible. If students play this game a half dozen times during the year, they will soon start recognizing the names of these Biblical heroes outside of class and they will also have some idea of where in the Old Testament they can be found. Any of these games will give students valuable groundwork to build upon when they start more intense Biblical studies and discussions. Some of these games even offer two and three versions, allowing you to choose the version that best fits your number of children and the level of difficulty needed. How Much Would These Games Be Worth to You? How much would it be worth to you to be able to reach all your kids from young to old at the same time? 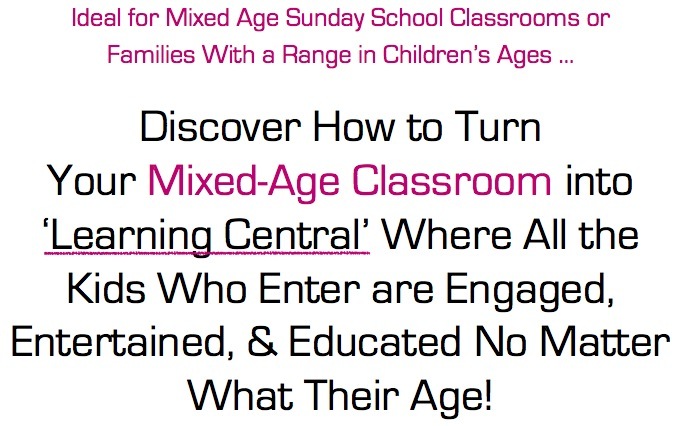 How much would it be worth to you to not have to worry about how you’re going to teach all your mixed-age students this coming Sunday (and many, many Sundays after that as well)? Well, if you act now you can get the “Games for Groups” Activity Kit for the introductory price of just $27 – that’s a full $20 off our regular price of $47. But you have to hurry, this is a limited time offer that will expire after just 200 orders have been received. At that time, we’ll raise the price to the regular price of $47. So don’t delay, order now and get “Games for Groups” at this special discounted price! Following Bonus Gift Completely FREE! Bonus Gift – 20 “Early Bird” Activities That Teach Virtues! Students who arrive at Sunday school before the others are often called ‘Early Birds’. But ‘Early Birds’ do not always catch the worm; sometimes they open a can of them! When ‘Early Bird’ kids turn wild, it’s not because they’re bad kids, they’re just being kids, but free time with no one in charge is an invitation for a free-for-all. Younger children will receive a coloring sheet with the virtue, related scripture, and the simple instruction. For example: Draw a picture of a time you were [name of the virtue]. Older children will receive a coloring sheet with the same virtue and scripture, as well as a little word game. They may also color on the sheets. Sheets can either be taken home with other materials from that day’s lesson, or you may save them all and make up a little book to give to parents at the end of the ten weeks. With this bonus, you’ll enjoy peace of mind while children are arriving—and be proud that as each student appears, parents will see the class already coloring calmly! But Again This Bonus is Only Available to the First 200 Who Order … Which Means to Get This Early Bird Bonus You Need to be an Early Bird Yourself & Order Now! That’s right, I am so sure that you will love the “Games for Groups” Activity Kit that I am offering an unconditional 100% money-back guarantee. If you are not completely satisfied with your kit, all you have to do is notify me within 60 days of your date of purchase and I will refund your money, in full, with absolutely no questions asked! Plus, when you order the “Games for Groups” Activity Kit you can take advantage of the immediate download feature to get the full kit in just minutes … that means you could be using it to teach this Sunday – even if right now it’s Saturday night! Then order your copy of the “Games for Groups” Activity Kit for just $27 today. You’ll also receive the Early Bird Bonus, which you’ll need because when you start using “Games for Groups” kids will soon start showing up early, eager to play the next game! Just click on the order now button below to get your copy of “Games for Groups” today! P.S. Kids learn better when they are having fun and that’s exactly what these games do … they allow kids of all ages to have fun while drawing closer to God. What could possibly be better than that? To get your copy of this very special activity kit at the low price of just $27 order now. Remember, order soon enough and you’ll also receive “20 Early Bird Activities That Teach Virtues” completely FREE. P.P.S. Also remember that you are making this purchase at absolutely no risk. So grab this special price while you can! If the “Games for Groups” Activity Kit isn’t everything you were expecting, you can request a full refund. It gives you 30 fun, unique, informative games in one easy-to-use kit. Why spend hours and hours tracking down games that may or may not be effective when you can get exactly what you need right here for one low price? Still questioning whether this kit is right for you? Email me to discuss how this kit can benefit you – and your students.